During the construction phase, roads are built and graded, the foundation ground is excavated and graded, foundation is poured; the tower sections are placed, assembled, and connected; the blades and generator are installed, and the final assembly is tested. Construction activities, in general, are often dangerous. Much of the work is highly physical in nature. Heavy equipment and graders and cranes are used. Components are raised into place. Workers must climb ladders, be suspended, depend on full body harnesses and lanyards, snap-hooks, carbiners, slings, fall-arresting systems. Sometimes work can be done inside, but not always. Lifting components depends on using properly rated and tested slings and rigging gear. 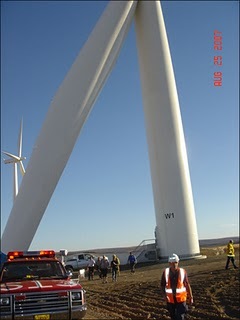 Once operational, the turbines may need to be shutdown for mechanical, electrical, and/or instrumentation maintenance. Maintenance may include component replacement. Work with a turbine rotor moving would be the most dangerous condition. For that reason, maintenance should not be done and entry into or onto the tower should not allowed if the rotor is moving. Many of the worker activities applicable during construction are also applicable during operation phase maintenance. Mechanical maintenance could include work on the supports (e.g. guy wires), structure, turbine, nacelle, brakes, or blades. Overspeed, brake failures, falls, dropped equipment are illustrative of concerns while performing mechanical maintenance. Electrical maintenance could include work on the wiring inside the generator or between the generator and the transformer. Work in electrical cabinets could involve higher voltages and be considered electrical in nature. Work on low voltage circuits would be considered as instrumentation in nature. With instrumentation there is often the possibility of shock but not burns or death as may occur with electrical circuits, unless amperage is elevated. The course textbook (References 1-3) and Gipe's website (http://www.wind-works.org/) give numerous examples of maintenance and construction issues. Amperage in circuits determines the possibility of injury (Reference 4). NIOSH describes how and why electricity is dangerous (Reference 5). The ConEd event, while not specifically dealing with a wind turbine unit, is illustrative of a type of electrical problem. (Reference 6). 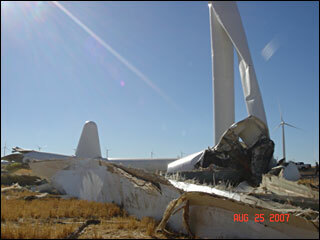 Chadd Mitchell’s death during maintenance on a wind tower near Wasco in 2007 highlights the importance of safety training, knowledge of safety practices and equipment, and the life threatening potential of wind tower maintenance. The photos above show the consequence of failure in that event (References 7, 8).